The Tornado II Protein Skimmer is the New improved version of the popular Tornado protein skimmer. No more pressure loss on the inlet due to the absence of a venturi. Water goes straight into the filter. Air is blown into the 4mm air inlet through a supplied flowmeter to ensure a continuous flow of 0,5 l/m (30 l/h). This pressure ensures the separation of the produced foam through the foam outlet pipe. The Tornado II Protein Skimmer is a combination of three different filter systems. 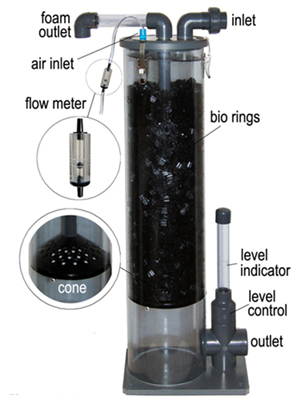 The Tornado II Protein Skimmer filter operates biological, mechanical and chemical. The Tornado II Protein Skimmer principle operates as follows: The surface of an air bubble attracts dissolved substances out of the water. Because of the adhesion of the bubbles these substances, like chemicals, waste particles, colourants and algae, are concentrated. By means of an air pump, air is mixed with water. By forcing this mixture through the bio rings to a lower part, there is a long contact between air and water. This changes the surface tension of the water continuously and creates a thick foam. This foam will be separated from the cleared water by a perforated cone and exits through the foam outlet. Dissolved substances like; phosphates, ammonia, humus acids, colourants, proteins and a number of heavy metals, are filtered out of the water and separated together with the foam. The extraction of dissolved substances is not possible with normal filters and can only be done if chemicals are added. Not dependant on bacteria, works as soon as the pump is running.